This sunflower is a volunteer in our garden. It sprang up right under the bird feeder which is filled with sunflower seeds. I’ve actually tried numerous times to grow sunflowers in my garden to no avail, but there was no stopping this little upstart. Over the last couple of months, it has grown into a beautiful sunflower–following the sun from east to west every day. And, when you think about it, keeping your face to the sun and turning toward the bright side really is a shining example worth following. Sometimes it’s difficult to live on the bright side of things. Especially, when you feel that you’re in the midst of upsetting circumstances and chaos. This has been a trying week as Maud, our beloved 10-year-old bluetick hound, became seriously ill last Saturday. She was fine one minute and bleeding from her mouth and passing blood in her stool the next. After rushing her to the emergency vet Saturday evening, plus two trips to the vet on Monday due to worsening symptoms, and another vet visit on Wednesday—we’ve finally narrowed down her problem to a possible autoimmune disorder that destroys her platelets and red blood cells. Maud is very fragile and at a critical point. Her bone marrow is not producing new red blood cells yet, and every time she moves, new bleeding can start. She is receiving drugs to suppress her immune system so that it will stop attacking her platelets and red blood cells. But right now, it’s just a waiting game to keep her stable in order to avoid a blood transfusion. Our vet decided that it was prudent to hospitalize Maud to monitor her and keep her still. Let me just say…it’s very difficult to leave a pet that you love so much when they’re sick and feeling totally miserable. So, with heavy hearts and after giving her lots of gentle hugs and kisses, we left Maud at the clinic yesterday. This morning I arose eager to hear how Maud progressed overnight and to learn if her red blood cell count had increased. The clinic wasn’t open, yet. So, farm chores would happen first. 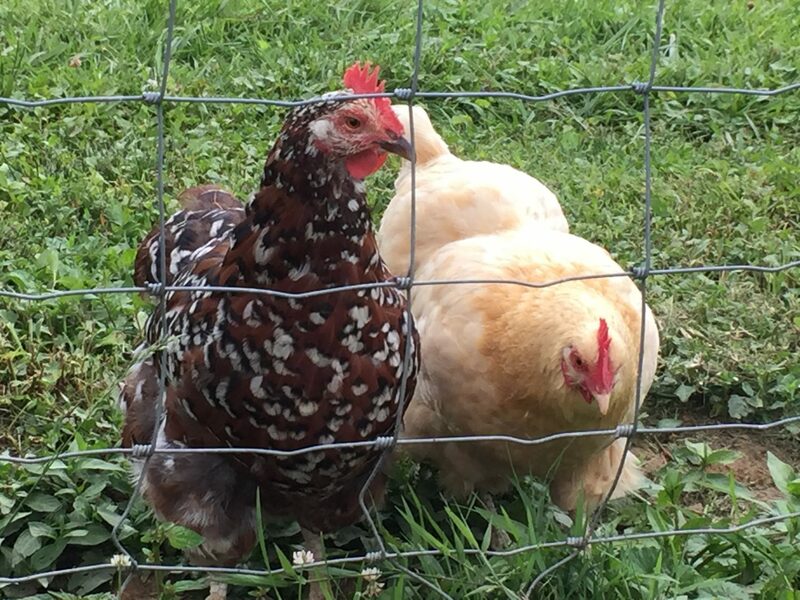 Honey, a disabled, older hen, is another well-loved critter on Green Hill Farm. This morning, upon taking her out of the coop (she can’t get out on her own), we realized that she had fly strike. This is something that can happen to farm animals in the heat of the summer and results in flies laying eggs that turn into fly larvae or maggots. Yes, it’s quite disgusting and definitely not a welcome sight anytime, but especially not this morning. Anyway, we cleaned Honey with warm water and removed as many of the intruders as possible. We also dusted her with something to kill the remaining larvae. After all of this intervention, Honey was not looking very good. She looked a bit anemic and maybe as though she’d gone into shock. I ran to get a towel and wrapped her up, holding her against me and petting her little head. In a while, I dipped her beak in the waterer to get a drink; she drank some water and seemed to be feeling better. Farmguy made a “bed” for Honey in the coop, and we placed her under a heat lamp with some food and scratch. She appeared to be doing okay as she was eating and drinking the last time I checked on her. I hope we caught it in time. As I said earlier, this week has been challenging. There were moments, however, that comforted me and cheered my heart: Yesterday, as I stood in the exam room at the vet clinic, half in shock and heartbroken about Maud’s diagnosis, our vet walked over and said, “I’m going to give you a hug.” I was touched by his empathetic and caring manner, especially in light of this being a very busy clinic where other patients were waiting. And, then, as I was leaving the clinic…just when I needed it most, I ran into someone I hadn’t seen in years. Kate, a gal I knew from our old neighborhood, gave me the warmest hug and a kiss on the cheek, while assuring me with her sweet demeanor that everything would be okay. I take our pets, including the chickens, to this clinic all of the time, and I NEVER see anyone I know. But, today—I did. It wasn’t just anyone, either. It was someone with a loving and friendly personality–one that readily reaches out to lift up and comfort others. And, I felt grateful. The other silver-lining moment happened this morning, after the larvae removal and hen-saving measures were completed. Farmguy was checking food and water levels in the other coop, when he found an egg–a tiny, speckled, brown egg. It’s the FIRST egg we’ve had since we got chicks this spring, and after a fox killed our flock of hens last fall. It really was a lovely surprise that lifted my spirits following the day’s stressful beginning. I finally spoke to someone at the vet clinic, and Maud was stable overnight and this morning. She ate a little breakfast of baby food and wagged her tail. It wasn’t perfect news, but I’ll take it. Here’s the thing: A situation may look dark; however, if we stay on the bright side–keeping our faces to the sun, then we’re much better able to see and appreciate those little moments that warm and gladden our hearts. Bless your heart. Seeing our pets in pain is one of the most helpless feelings…the pics of Maud above are terrific. I especially love the one where she’s at the fence, head thrown back, looking like she’s howling for all she’s worth. I hope she feels better soon! Get well soon Maud and honey. Your life is trying but blessed. Kudos to all of you there!! Many thanks, Shivangi. What a generous thing to say! Beautiful perspective and sentiments. Hope Maud the best outcome. That is so kind, Doug. A heartfelt thank you! Wow. When it rains it pours and your storm is not even staying outside, but hitting you right in your innermost soul! I’m so sorry, but I’m also so glad….glad you were given these animals to care for, glad you got them the help they need when they needed it, and glad because I know that no matter what happens, you’re strong enough to realize that though you can’t control every event, you can make it through anything because you are that Fourth-Generation Farmgirl! Sending good wishes for all of you! Your metaphor is spot on, Torrie, and I’m touched by your support and encouragement. Thank you so very much. What a beautiful and touching post. You and yours, and Maud and Honey are in my thoughts. Thank you so much. I really appreciate your kindness. That was such a moving post. I’m so glad Maud is feeling better, and you were able to comfort the hen. Gosh, what a rough time. You’re right, there’s wisdom in that sunflower 🙂 What a blessing to read how you survive the trials and lessons of love and compassion on your farm. Thank you for sharing. Thanks so much, Joey. Your comments are comforting. What a week! Hope your babies get better soon! It’s so hard to see an animal suffering in pain. I always feel so helpless when it happens to one of mine. Thank you, Michelle. I appreciate your comment. Thank you for your positive words and kind support, Judy. It certainly means a lot to us. That is such a nice thing to say, Becky. Thanks so much for your well wishes. A situation may look dark; however, if we stay on the bright side–keeping our faces to the sun, then we’re much better able to see and appreciate those little moments that warm and gladden our hearts. Very true, as a human being we immediately lose hope and it worsen the situation, isn’t it, good post and enjoyable experience to read it……………..
Lots of healing thoughts and love to you and the fur kids.